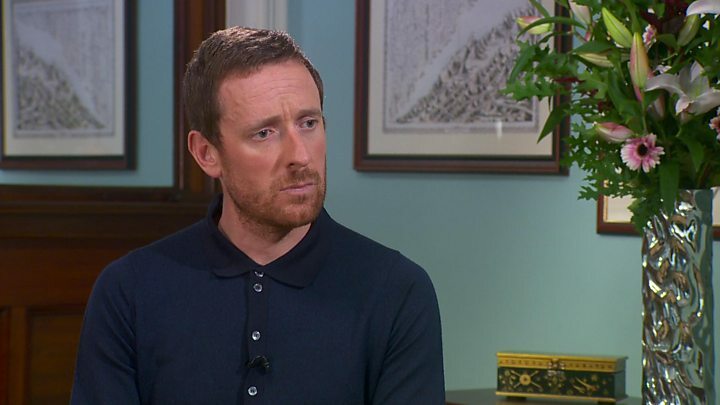 Sir Bradley Wiggins has insisted he was not trying to gain an "unfair advantage" from being allowed to use a banned steroid before major races. The Olympic cyclist told the BBC's Andrew Marr Show he took the powerful anti-inflammatory drug triamcinolone for allergies and respiratory problems. Sir Bradley said he sought therapeutic use exemptions (TUEs) to "put himself back on a level playing field". Sir Bradley's TUEs were approved by British authorities and cycling's world governing body, the UCI. Sir Hugh Robertson, vice-chairman of the British Olympic Association, told BBC Radio 5 live's Sportsweek: "Whatever you think about whether he should have been allowed to do this, the fact is the anti-doping rules at the time allowed him to do so. "There was a set of rules in place with which he complied entirely." Sir Bradley's use of the substance has come under scrutiny following revelations made by computer hackers known as Fancy Bears, last week. The details were revealed after the group accessed the private medical data of some of the world's leading athletes from the World Anti-Doping Agency (Wada). But a former team doctor of Sir Bradley told BBC Newsnight on Friday that he was "surprised" he had been prescribed the drug. He took the drug shortly before the 2011 and 2012 editions of the Tour de France and the 2013 Giro d'Italia. The five-time Olympic champion and 2012 Tour de France winner told BBC One's Andrew Marr Show he had been "a life-long sufferer of asthma". "I went to my team doctor at the time and we went, in turn, to a specialist to see if there's anything else we could do to cure these problems." Sir Bradley said doping within cycling was still "an open wound" and said triamcinolone had previously been "abused" by riders. However, he added: "This was to cure a medical condition. This wasn't about trying to find a way to gain an unfair advantage. "This was about putting myself back on a level playing-field in order to compete at the highest level." He said he had been "struggling" with asthma and his breathing before the 2012 Tour de France and decided to "take that medical advice". "When you win the race three weeks out from the Tour de France, as I did, you're the favourite for the Tour. "And, in turn, I took that medical advice (to take triamcinolone)." and that there's no reasonable therapeutic alternative. Prentice Steffen told BBC's Newsnight that the sport's governing body was wrong to give the cyclist permission to use a powerful corticosteroid before major races. He said: "I was surprised to see there were TUEs documented for intramuscular triamcinolone just before three major events - two Tours de France and one Tour d'Italia. "You do have to think it is kind of coincidental that a big dose of intramuscular long-acting corticosteroids would be needed at that… exact time before the most important race of the season. "I would say certainly now in retrospect it doesn't look good, it doesn't look right from a health or sporting perspective." BBC Newsnight also spoke to the convicted doper Michael Rasmussen, who said that, taken in isolation, the pattern of Wiggins's use of the corticosteroid triamcinolone ahead of major races seemed "suspicious". Team Sky has previously defended its use of TUEs, saying: "TUEs for Team Sky riders have been granted by the appropriate authorities and in complete accordance with the rules. "This is a complex area given the obvious issues around medical confidentiality. There is a legitimate debate across sport on where best to draw the line on transparency. "It is very rare that a rider needs a TUE and we have robust internal processes in place that we are confident in and which we constantly review. "Team Sky's approach to anti-doping and our commitment to clean competition are well known." A spokesman for the UCI said: "The management of Therapeutic Use Exemptions in cycling is robust and fully safeguarded."